Job posting trends indicate positive outlook for environmental professionals in Canada. In 2017, job postings in the sector bounced back with almost 23,000 postings, reflecting a 9% increase from 2016 levels. The implementation of various environmental programs at a provincial level, along with other economic factors, accentuated the increase in job opportunities. Specific areas of practice have experienced higher demand, which also reflect the relevancy of those factors within the environmental context. 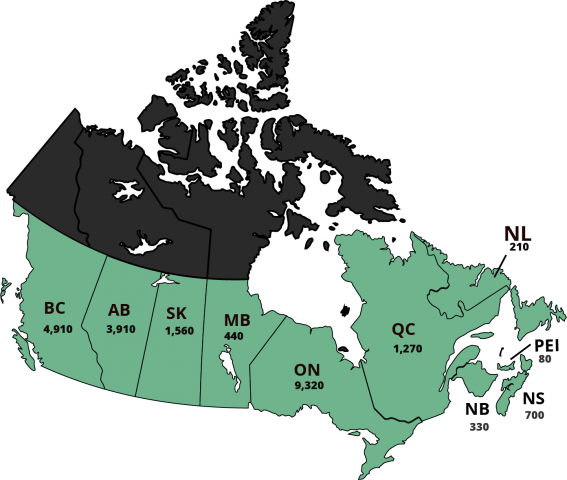 ECO Canada created a map with the number of English-language postings by province in 2017, which serves as a guide for job seekers to spot the locations where environmental workers can find emerging opportunities. Ontario, British Columbia, and Alberta are the provinces that have consistently shown the most demand for environmental professionals between 2014 and 2017. As observed in the map, 80% of the job opportunities posted are concentrated in these regions. British Columbia is also the only province where share of environmental postings kept increasing between 2014 and 2017, despite the economic downturn in 2015-16. In Alberta, job postings increased significantly between 2016 and 2017, hinting recovery economic and job recovery. Ontario has a more diversified economy, and as a result, its environmental job ad curve remains steady. Although those three regions stand out because of their Gross Domestic Product (GDP), population and labour force size, the Canadian provinces that experienced the highest growth rates in job postings from 2016 to 2017 were Nova Scotia with a 61% increase, Saskatchewan with 53%, and Newfoundland and Labrador with 49%. This means that environmental initiatives taking place in these provinces are also resulting in work opportunities. In Canada, the top environmental areas of practice are related to Natural Resource Management, Environmental Health and Safety, Waste Management, Water Quality and Energy Efficiency. The implementation of environmental programs at a provincial level has positively impacted the increase in the number of job postings. For example, in Ontario’s cleantech strategies prioritize energy generation, energy infrastructure, bio-products and bio-chemicals as well as water and wastewater. Meanwhile, Nova Scotia is the first region in North America to make LED streetlights the law, which are expected to reduce greenhouse gas emissions by my more than 30,000 tons. At the same time, commitment to create STEM jobs for young people is an ongoing project in Canada. Federal initiatives, such as the Youth Employment Strategy, bridge the school-to-work gap new graduates face when looking for jobs. ECO Canada has been administering wage funding programs to advance environmental employment, and it recently helped creating 2,400 jobs. Learn more about employment trends in the environmental sector in our latest report.